So you’ve carved your Halloween pumpkin, and it is a masterpiece! The last thing you would want to see after carving some Halloween pumpkins is the lovely carved out smiles turning into rotting grimaces. 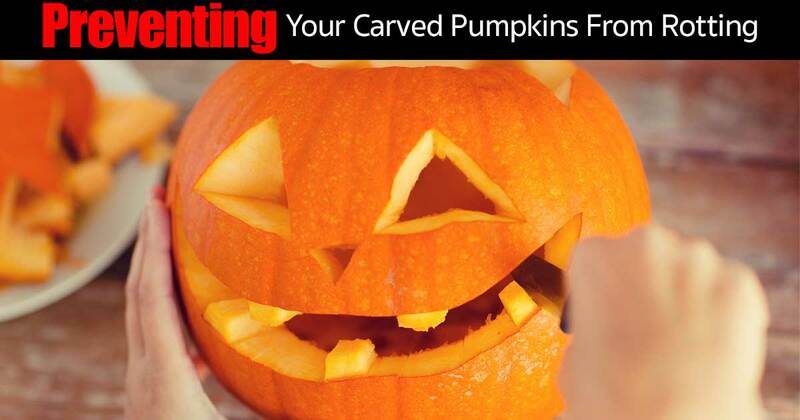 You cannot completely stop pumpkins from rotting. Once exposed to air, mold, and bacteria they will naturally begin to rot. However, you can take steps to keep them looking fresh and beautiful, plus “make the pumpkin last longer,” whether carved or uncarved. Stop for a moment to consider the journey this colorful winter squash travels for your enjoyment. This giant pumpkin, some as big as a basketball began as a small pumpkin seed planted in soil. From there the pumpkin vine started to grow, the leaves and flowers battled the elements, enduring days of direct sun, along with overcoming diseases like root rot, blossom end rot, and the white powdery mildew. Its sole purpose is to decorate your front porch as a Halloween pumpkin or become a part of grandma’s delicious pumpkin pie! What a life! However, your journey begins with selecting your pumpkin. Some families make a big “to-do” of picking this winter squash. The whole family heads to a farm where they walk the fields full of giant pumpkins searching for the perfect gourd to harvest fresh from the vine. Some get their pumpkin at the local grocery store. After many miles of travel and handling, and before any carving begins, clean the outside of the pumpkin. Using paper towels, dry off all the excess moisture from the surface of the pumpkin. … and slow down developing mold. Perhaps, the best method to prevent carved or uncarved pumpkins from rotting is by preserving the pumpkin with bleach. Spray your pumpkins, including the inside, the edges and all cut openings with a mixture of 1 tablespoon of bleach per quart of water to get rid of all the mold, mildew and other unwanted stuff. Another way is to soak the pumpkins in bleach using the same bleach solution for about 20 minutes. Giving your decorated pumpkins a solid misting with a bleach-based spray, such as Clorox Cleanup with Bleach can also come to the rescue. Several commercial pumpkin preservative sprays, specially formulated to prevent pumpkins from decaying are on the market. With names such as Pumpkin Fresh and Pumpkin Dunk’N extend the storage life of your carved pumpkin and keep it from rotting. These preservatives contain water, borax and sodium benzoate. They work as a fungicidal solution that kills bacteria and mold. All you need to do is dry the surface and spray the pumpkins with any of these marvelous sprays to make them last until your Happy Halloween. Floor cleaners can also work as excellent preservatives for uncarved pumpkins, keeping them shiny and fresh for up to four weeks. All you need to do is apply an acrylic liquid floor cleaner to a wet towel and wipe the pumpkins with the same. Hairspray and acrylic finish sprays are another great sealants that prevent pumpkins from getting dehydrated. The sprays work as a barrier to mold growth, at the same time preventing rodents from eating your jack-o-lanterns away. Exhibiting anti-freezing and water-repelling properties, WD-40 is impressive when it comes to keeping uncarved pumpkins fresh for longer. WD-40 also prevents insects and other creepy crawlers from swarming around the inside of your decorated buddies. Carved pumpkins can reap the benefits too! Simply spray WD-40 over the surface of the pumpkin and wipe off the excess. Wait a day to allow the spray to dry completely before you place a candle inside. Remember, chemicals and oils are usually flammable and can prove to be dangerous if you choose to keep your pumpkins from rotting with these solutions and place candles insides. Instead, you can put glow sticks or battery-operated tea lights inside your Halloween jack-o-lanterns.